Four days ago when I read that Steve Jobs has passed away, my mind went blank for a bit. I had expected him to live on for a few more decades, especially since he had just stepped down from his CEO post at Apple in late August. I had expected Jobs to create a few more revolutionary products that will wow my pants off until I hit old age. Throughout my life, Jobs had made me hanker after the iMac, iPod, iPhone and now iPad. And now, to think that there may never be another genius like him was a shock. The irony was that I had written about him briefly in my editor’s letter for the October issue. In fact, it was probably the nth time I mentioned Apple in all my columns. It’s funny how life works. Many tributes poured in for Jobs that entire day. Most of the updates found on social networks were some of Jobs’ quotes. Reading through them were inspiring. It was impressive how someone whom I have never met and who did not know of my existence made me reevaluate my life that day. I texted a few friends that morning to share with them my thoughts and one of them managed to annoy me that with her comments. But one made me laughed so much that day because our conversation diverged into other unrelated topics. 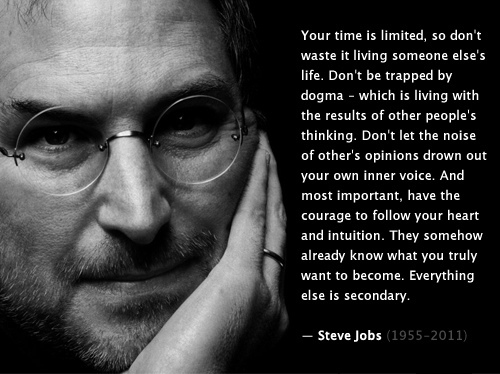 Anyway, I just spent 15 minutes reading Jobs’ commencement address delivered in 2005 to the graduates of Stanford and his speech struck a poignant chord in me. Here are a few quotes that stood out for me. Don’t lose faith. I’m convinced that the only thing that kept me going was that I loved what I did. You’ve got to find what you love… Your work is going to fill a large part of your life, and the only way to be truly satisfied is to do what you believe is great work. And the only way to do great work is to love what you do. If you haven’t found it yet, keep looking. Don’t settle. And the quote that hit me the hardest that morning is the one in the image above. What Jobs said was and still is true. I truly believe in the values he shared that day. If you spent your life trying to live up to other people’s expectations or trying to please them, you lose sight of who you really are and what truly makes you happy. If you live in fear and constantly worrying about other people’s opinions of you, you will never be happy because you will always wonder about the “what ifs”. Remember, your happiness comes first. Everything else is secondary. Nice post. I agree that the tributes were inspiring and very impressive. Isn’t it wonderful how great people bring out the best in us too.